Yesterday I had a hankering for feijoa muffins, which is weird because I'm not usually a fan of feijoas - at least not in their natural state. But something about the sharp tangy-ness of them in a muffin had me dreaming of baking a batch all afternoon, until at 3 o'clock school pickup time I could stand it no more, and googled myself a recipe. 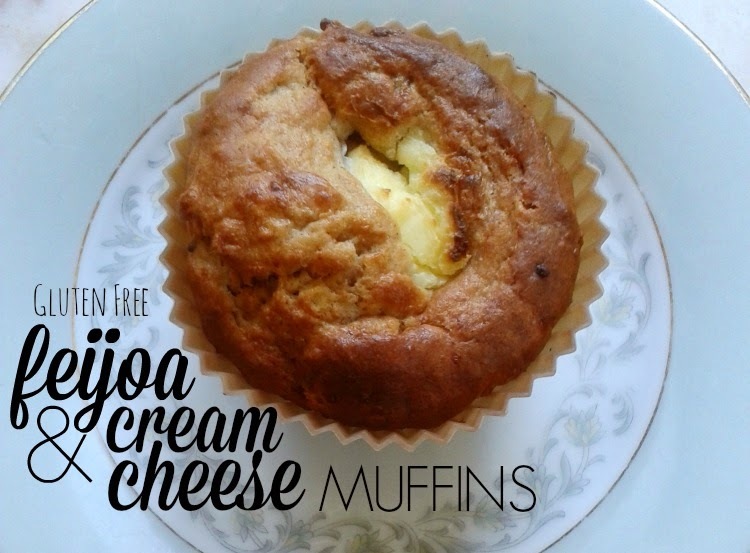 When this one for feijoa and cream cheese muffins popped up, it sounded perfect - nice and simple, plus I had all the ingredients. Most importantly I had a tree full of feijoas wasting away. After sending out Scrag to gather the necessary fruit from the backyard (in gumboots to avoid feijoas getting squished between his toes) I road tested the recipe. I've made a few simplifications and adjustments and I've used gluten-free baking mix instead of standard flour (if you don't need gluten free, just go ahead and use regular plain flour). Send a small child out to pick up a bowl full of feijoas. Slice each feijoa in half, scoop out the flesh, repeat until you have a cupful in a mixing bowl. Smoosh the flesh with a wooden spoon (pound on it til it's nice and slushy). Add the sugar and melted butter to the smooshed feijoas. Mix well. Whisk together eggs, sour cream (or yoghurt) and lemon zest+juice. Combine with the feijoa mixture. Spoon the mixture into greased or lined muffin tins (I use silicone). 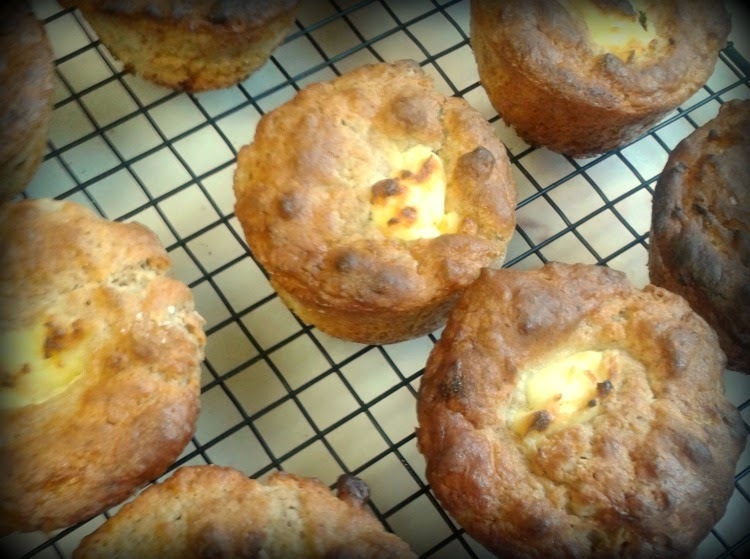 Bake for 20 minutes, then enjoy them warm from the oven with a cuppa on a cool autumn day. Mmmmmmm. Very satisfying and delicious! 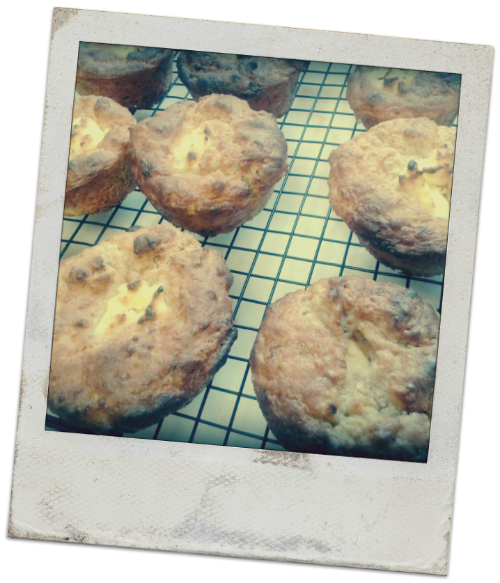 This recipe made 18 muffins - enough for all of us to enjoy as a treat for afternoon tea, dessert AND lunchboxes the next day, with more left over. (As I type this I've been munching on one for my morning tea).